Baron Brrr (or Baron Brr) is a boss in Super Mario Galaxy. Mario fights him on the icy mountain of Freezeflame Galaxy. Baron Brrr resembles a giant Li'l Brr but with more protrusions around his body and a more symmetrical, finely cut appearance. 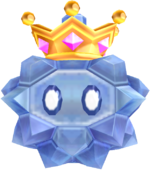 He sports a jeweled crown similar to King Boo's. Baron Brrr appears in the Freezeflame Galaxy in the level "The Frozen Peak of Baron Brrr" where he is up on the third level of the mountain. 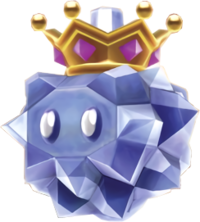 When Mario reaches the area, Baron Brrr begins firing balls of ice at him out of his crown. Mario must dodge the Ice Balls and go to the left side of the platform to get an Ice Flower (the other side will lead to coins). Using the Ice Flower, Mario becomes Ice Mario and can run across the water to the front of Baron Brrr's platform. There he must Wall Jump up to the platform with Baron Brrr on it. Baron Brrr will start slamming down onto the ground, creating icy waves which Mario can dodge by jumping. He then must Spin near the Baron while he is on the ground. After being hit, Baron Brrr will turn small and hard and try to escape from Mario, who must Spin him again to damage him. The player must do this two more times. After Baron Brrr is damaged twice, he calls two Ice Bubbles to help him. When Baron Brrr is defeated, he releases a Power Star. Baron Brrr's name may be a reference to the third American Vice President, Aaron Burr. Baron Brrr's boss music is the same as the Deep Dark Galaxy's Undergrunt Gunner's boss music. In Super Mario Galaxy 2, King Lakitu and the Stink Bug Parent's theme is a remix of the theme of Baron Brrr. ↑ Black, Fletcher. Super Mario Galaxy PRIMA Official Game Guide. Pages 179, 181, 189. This page was last edited on February 8, 2019, at 13:01.